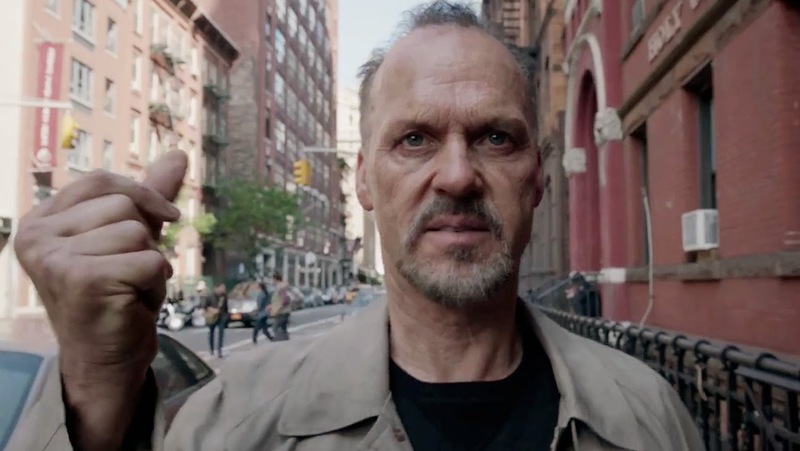 To separate Michael Keaton from his performance in “Birdman” would be to undermine an essential insight into the parallels of a shared existence. Much like the conflicted actor he plays, here is a movie star whose success in front of the camera was clearly diminished by the overreaching shadows of one prominent role in the distant past: that of a very popular screen superhero. For Keaton, that came in the form of Batman; for Riggan (the man he plays), it was a giant avian crusader aptly named, well, Birdman. Throughout the course of events of the film, random eyes often meet Riggan not with respect or chemistry, but with an almost detached sense of nostalgic fascination; once upon a time this was a guy who was at the center of a very ambitious spectacle of costume and action, and few are able to separate the mask from the one who first wore it. So effortless are Keaton’s own subtle scoffs to these realities that one never wonders if they truly originate from a place of empathetic recognition. Some have said that to play a superhero in a movie forever damns you to the professional prison of the alter ego, and if that indeed rings true, than there is no denying that Keaton’s career trajectory is a textbook example of that unfortunate curse. This is a role he was born to play, not just in the sense that it hits all the autobiographical notes or exemplifies a certain resonating psychology, but in the sense that it requires the same mannered and probing style that was always part of his undeniable forte. Seeing him in Alejandro González Iñárritu’s thoughtful film is almost sobering in how it calls to mind the unfortunate awareness of his more recent professional obscurity. And yet there is never a moment, we suspect, where Keaton has regret or is chewing up scenery in some vengeful manner. As a man who refuses to rest on his damning laurels who possesses an eagerness to set out on a new course, he is utterly sublime and tactful here, and doesn’t allow himself to be driven by overzealous camera mugging or hammy projection. “Birdman” is, even in his eyes, a more universal excursion through the recess of damaging memories, and in dealing with the repercussions it discovers a central theme that has resounding power on anyone who identifies with the stigma of life lived in the trenches of faded glories. What a wonderful achievement this movie is, collectively as an example of intense acting, effective storytelling and brilliant (but understated) technical ambition. To suggest that it had me eagerly leaning forward the whole time while feasting on its immeasurable details would be downplaying my enthusiasm; for two hours I watched with unending eagerness, content with the notion that it would focus entirely on the element of dialogue exchanges between aggravated characters, and very little time on the sensation of action or visual indulgence. To hear a title like “Birdman” to begin with suggests something grandiose, even silly; the fact that it comes attached to a film that perfectly balances humor and drama in the tight space of seven prominent characters is almost delightful in how misleading it seems. Ironic to think in context that the masked crusader is essentially a villain, too: a poison from which there is little escape beyond the acknowledgment that it has cost someone so much, and continues to hold some level of control over events of the present. The story takes place entirely in the span of just a couple of days. Immediately, we meet Riggan Thompson (Keaton), an actor-turned playwright who has just successfully adapted one of his favorite stories by Raymond Carver for a Broadway production, and is mere hours away from the first of several critical sneak previews before the show opens to a curious New York public. Why are they so fascinated? Because Riggan, once known in Hollywood as “the actor who played Birdman,” has never been associated with anything of significance since those career-changing portrayals. The fallen actor blames that notorious portrayal for the death of his own screen career (“I should never have done the fourth movie”), and even as his newfound venture in the theater pushes on he discovers, quite literally, that the Birdman continues to haunt his thoughts like some kind of literal dark conscience. “We handed these posers the keys to the kingdom,” his blunt alter-ego whispers. And even without yet knowing the full capacity of Riggan’s current dilemmas, one assumes that the Birdman’s words are like prophetic (if brutal) indications of wisdom. The movie bounces casually between reality and a vague sense of fantasy to exemplify the hero’s fractured state of mind. To him, the possible success of his play is less about the success itself, and more about the opportunity to shed a skin that has so worn him down through the years. Those involved in the production, of course, have their own motivations. That includes Lesley (Naomi Watts), a newcomer to Broadway who is obsessed with perfection for her first outing, and Laura (Andrea Riseborough), a supporting player that consistently looks to Riggan for some level of verbal approval (no doubt because they are both having an affair behind the scenes). In the early moments of the picture, their production is nearly collapsed by an accident that injures their lead actor; out of luck, they wind up replacing him at the last minute by Mike (Edward Norton), a highly-coveted theater thespian whose associations with the show may provide a much-needed boost to ticket sales, at least according to Riggan’s nervous lawyer Jake (Zach Galifianakis). Conflicts create mental hedge mazes for the focused Riggan. His newest addition to the cast isn’t just popular, but also a showboating scene-stealer who undermines the vision of others, including him. The relationship he has with his daughter Sam (Emma Stone) is broken beyond measure, even as she continues to sleepwalk through the grind of assisting behind the scenes of his theatrical vanity project. A failed marriage looms over his feelings in his dressing room scenes. Mike, so confident an actor and performer, is much less comfortable off stage; this adds tension between him and Lesley (his girlfriend) and a sense of forbidden arousal around Sam (the backstage daughter). His lawyer, whose earnest conviction originates from a place of realistic concern, refuses to cancel preview showings just because Riggan disapproves of the way things are going (yet never quite acknowledges that maybe, just maybe, the play itself is a sham to begin with). And even as all of these realities make themselves known in the midst of backstage drama leading to final preparations for the stage, the looming threat of a bad review from the New York Times (which could effectively close the show) goes to undermine any level of confidence Riggan has in his production, and a scene he shares with the critic towards the final act is sobering in how it calls to mind the divide of standards between sensationalized Hollywood and a more “serious” Broadway. The material’s dialogue is some of the sharpest and most probing of any movie of recent memory. In the company of three additional collaborators, director Alejandro González Iñárritu has fashioned a screenplay that marries the modern sensibility of its themes with an aura of character engagement that recalls the great stories of Arthur Miller and Tennessee Williams. There is a sense while watching it that all those involved in Riggan’s brewing disaster are using their association with the play as a means of dealing with their own crumbling self-confidence (even though they don’t directly admit so), and their shared interactions are punctuated by the kinds of harrowing confessions and outbursts that we often associate with the immediacy of theater-based dialogue. The performances surely anchor that sentiment; Keaton is a marvel as a washed-up outcast of the celebrity world trying to do something meaningful in middle age, and both Norton and Stone have a certain confident charisma that balances sarcasm with morose realizations, shared or isolated. If the film offers any major surprises from its ensemble, the greatest comes from Zach Galifianakis as the insecure but abrupt lawyer; so ordinarily accustomed to the physical element of comedy in most of his films (including the “Hangover” franchise), here is a man who shows us that he is capable of a remarkable sense of restraint in the skin of a deadpan observer, and his consistent intensity through a series of scenes that often involve him chasing his client through narrow hallways is a startling reminder that, even now, we are often unfair in our perceptions of actors often caught in silly comedies. Like his former “Hangover” co-star Bradley Cooper, he has revealed immense possibilities in the frames of an observant human drama. Remarkably, these highly infectious performances are nearly upstaged even further by a stellar sense of technical perspective. The entire film plays like one long, unbroken camera take in which all the characters are followed over the course of several days leading up to the play’s premiere, and even when significant gaps of time occur, everything is edited in such a way that it is seamless with the cinematography (the moment when Riggan steps away from a casual interaction backstage and into a final rehearsal is so slight that one must marvel at the perfection of the illusion). Iñárritu’s audacity to implore a lost art of style – initially tried by Alfred Hitchcock in his marvelous “Rope” – informs the movie’s perspective so vividly that it scarcely seems like fantasy; there are moments where we are whisked through the scenes completely awestruck by the accuracy of details, and our quiet observations are often intercut with the wonder of the moment (were these actors uncomfortable with the notion that they had to be on target with their lengthy takes, and did they make any grievous errors?). Simultaneously, the cinematography by Emmanuel Lubezki (“Children of Men,” “The Tree of Life”) is so joyous about its invasive presence in hushed conversations and tense arguments that it seems less like a window into lives and more like an unapologetic eavesdropper. “Birdman” is not the kind of movie that inherently depends on technique to work, but the fact that it is even there goes to highlight the continued dedication of its director, a man who has now made four terrific films (“Amores Perros,” “21 Grams” and “Babel”) in less time than most credible filmmakers do over an entire career. A great many films that last in the mind often do so because they shatter the immediacy of our human skepticism; in them we can almost become facets of a story and peers to a collection of relatable experiences. If a film is inclined to speak to us like a loyal friend, it is no longer just simple entertainment. Few endeavors occupy that reasoning (especially nowadays) and to sense that trait slowly emerging in a movie like “Birdman” is to be reminded of why we love going to the movies so relentlessly. This is one of the best and most surprising revelations of the year, a film that has the honesty to deal with the reality of the past, find meaning in the present and surround it with the acknowledgment that forging a new destiny must come from a place of action rather than simple morose meditation. And how joyous it is for us as onlookers to arrive at a climactic moment when both Riggan and his Birdman (figuratively or literally, I dare not say) find the motivation to fly again without looking back.